We got a new puppy! The first evening with a new puppy is a lot like having an infant. They cry and cry and cry. I have tried several different sleeping arrangements with past puppies, but that first night is always full of howls and yelps. 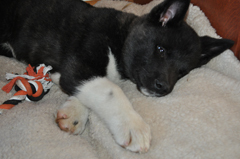 When we got our little Hiro, I was exhausted that first night. After getting up multiple times to let him outside, to snuggle, to feed him, I decided he was just going to have to cry-it-out. That’s right, this hypocritical blogger was resorting to methods found damaging to infants. Oh what would they do to my puppy? I tried Ferber’s techniques. I timed each session between getting up to give the puppy attention. I gave up. I couldn’t do it. My puppy was scared, alone, in distress. He was crying for the same reason our babies cry. He needed something, and that something was my love and attention. My puppy experience reminds me of why parents do resort to the cry-it-out method. It is the mental state we get to when we encounter exhaustion and frustration. We don’t know what else to do…but just like with babies, my puppy taught me the right way to ease his suffering and ultimately get more rest and peace. We got through that first night. I learned to take him outside, let him go potty, and make sure he had food and water to ensure his cries were not for want of basic needs. Then, I laid him down in his dog bed and stroked his fur until he fell asleep. We only had to do this two times. The rest of the night was quiet and restful, as have been the nights that followed. When we lay the groundwork of attachment parenting, whether with our children or our pets, it may take extra effort or energy on our part initially, but the lasting effects are worth it. Jennifer, after reading your article here, I can truly empathize and sympathize with you. I have the solution for you … if you are willing to take the time, energy and effort. And I can guarantee that anyone will have success in a few short hours. The reason why Hiro was crying, unable to sleep and wanting your comfort and companionship is that as a new puppy away from the litter … this was all new to him. He was frightened, scared, and felt very abandoned … even though you were just a room away. As you quickly learned, Hiro adjusted very quickly when you spent some time with him … comforting him. So, here is the solution !! It is called Snuggle Puppie !! Snuggle Puppies are plush toys … that aren’t just a plush toy. They are a “litter mate”. They have a patented velcro pouch … and a battery operated heart … providing the sensation for ANY puppie of dog … or even kitten or cat of being with their litter mates. Snuggle Puppies have been on the market for over 15 years … are safe, effective and will provide hours upon hours of comfort and peace for your young pup, kitten … or even an adult dog or cat. I have personally used a Snuggle Puppie with my keeshond Jake. Next time try an SnugglePuppie. They work every time and have been around for 15 years. They really work.